Contending with the most troublesome part of window tinting. Anyone that has installed automotive window film can attest that the most difficult area to successfully tint is the dot matrix area. Many installers have tried a variety of tricks to get the tint to stick properly to this area, while others have given up and simply install solid black vinyl to the area. Many of the materials that comprise the dots in the dot matrix are non-stick substances. The dots are designed to ward-off adhesion, so the installer is fighting against the very properties of the material. Imagine trying to get something to stick onto a Teflon coated frying pan – no matter what you do, things will just slide off. If the installer successfully gets the tint to adhere to the dots, they are then faced with the issue of “silvering.” Silvering is the term given to the inconsistent shiny outline that appears on dot matrix areas after tinting. To override the first issue, installers will use a mild abrasive to scuff the surface of the dots, turning them into a more likely subject for adhesion. When scuffing the surface is combined with a solution that promotes adhesion, installers are very likely to get a high-quality adhesion. Unfortunately, this strategy alone won’t prevent silvering. Silvering happens when the profile of the dots prevents the film from adhering directly to the glass. The dots are spaced so closely together that the film is suspended above the glass without being able to completely adhere. It’s like trying to apply a screen cover to a smartphone with a dirty screen – it won’t stick well, and you get those big circles around each dust particle. The gap between the film and the glass is what causes the silvering. This is a difficult problem, and resorting to sanding, painting, or vinyl wrapping your window to avoid the dot matrix silvering issue is a bit overkill. What we do at Diversity is infrared cure your film before handing it back to you. This means all of the moisture is out of the film before you take possession. This results in a more secure adhesion around the dots and greatly reduced silvering around the edges of your back windows. A little fingertip pressure is all it takes to make it disappear, without the need to make irreversible alterations to your windows. 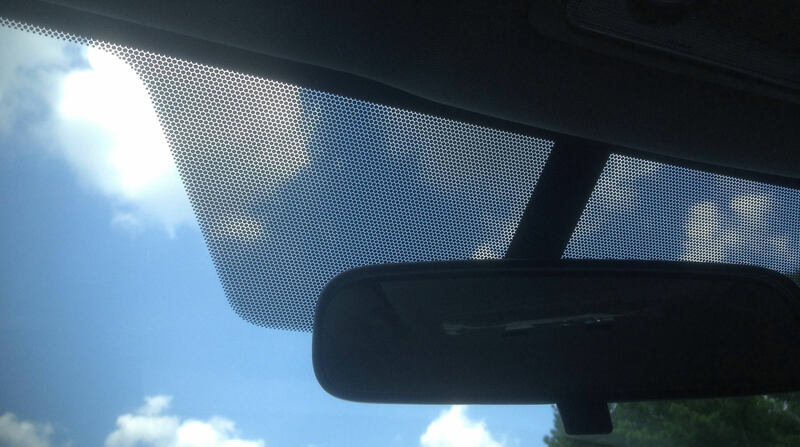 To avoid issues with the dot matrix, make sure you are dealing with an experienced and reputable tint shop. For a free quote, or to have any questions answered, just give us a call or send us a message. Is infrared curing the tint a common practice? It is for us! It means you don’t have to wait a week for the cloudiness to go away and your get your vehicle back factory fresh. next post: Why won’t my windows come clean?